Fangirls, I want to say that I’ve been slowly assimilating LUSH products into my life, but we all know that’s nonsense. I have dived into LUSH Cosmetics headfirst, and my addiction may be spiraling out of control. Luckily, it’s an addiction that is proving to be rather good for my body, or my skin at least! First up of the amazing new products I’ve added into my (almost) daily beauty routine, is LUSH’s Love Lettuce Fresh Face Mask. We all know that I prefer a face mask that I can peel off, but this bad boy feels so darn good that I forgive it for not being peel-able. It’s a lovely mask, made up of ground almonds among other things. Every couple nights I rub this baby into my face, let it sit for 10-15 minutes, and then wash it off with cool water. I think it’s helping my skin out a lot; the humidity of Upstate New York may not be as intense as Florida’s, but it’s still rough on my skin. I hate feeling oily and greasy, and Love Lettuce helps me clean up before bed, so I can go to be feeling refreshed without dunking my head in an ice bath. I’ve also started falling in love with the Cosmetic Warrior Fresh Face Mask. This, and Love Lettuce were both recommended to me via LUSH’s twitter; they’re very active on social media, so if you’ve got a question, you should ask it! They’ve been so darn helpful for me. Anyways. Cosmetic Warrior, similarly to Love Lettuce, is something I use at night, and helps me feel clean before diving into bed. Made with eggs, grapes, tea tree oil, and honey (among other things) this mask doesn’t just feel good, it smells good too. I love anything with tea tree oil in it; it makes me feel my skin is being cleaned and tightened at the same time. And while Love Lettuce is something that is good for any skin type, Cosmetic Warrior is specifically for oily and spotty skin. I tend to get really oily skin, especially in the summer. So I go back and forth with my bi-nightly usage, between Love Lettuce and Cosmetic Warrior. They both make my face feel really good, and help me go to bed with skin that doesn’t feel super nasty. Now, these Fresh Face Masks are amazing, but they can only be bought in store because they’re made of such fresh ingredients! It’s a small price to pay for a product made especially for you. One thing that I’ve fallen in love with that I can still order online, is an exfoliant called Dark Angels. Dark Angels is a rad as heck charcoal exfoliant that doesn’t need to be refrigerated, and lasts a bit longer. The fresh Face Masks have a shelf life of under a month, where Dark Angels lasts just over a month. 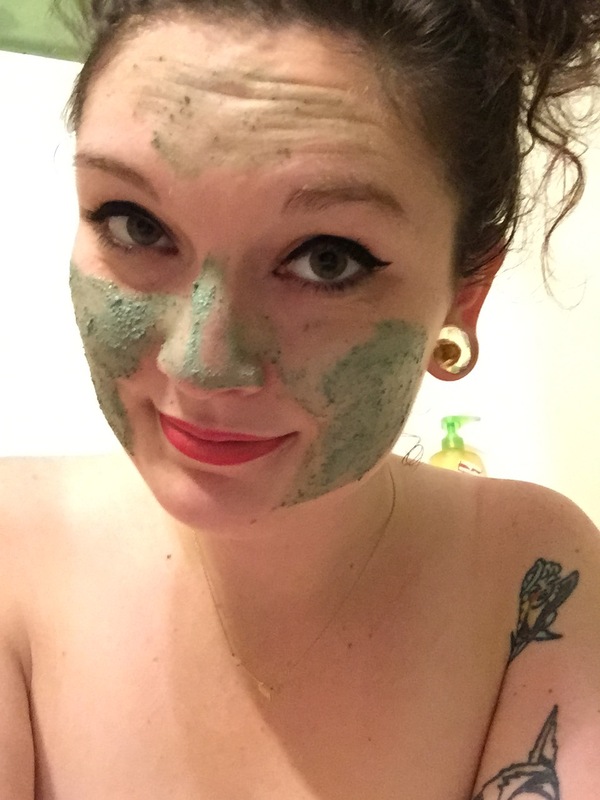 At first I only used my Dark Angels scrub on my face, and wanted to ration it. But when I realized that there is a “best by” date, I started slathering it all over! I use it every morning, before my shower, on my face at least, but it also feels great on my arms, hands, chest, stomach, and legs. Basically, everywhere! I’ve found that the way to go into a LUSH shop is with an open mind, and lots of questions. I try to ask a sales associate what their “must have” LUSH product is, and that’s how I found out about Dark Angels. I’m really quite grateful to the young lady who helped me out, because my skin feels soft and strong, and resistant to oils! So Fangirls, these are some products that are helping my skin survive the summer! Thank you, LUSH, for making such rad products that are helping me out so much. If you’re looking to try out a Fresh Face Mask, I definitely recommend Love Lettuce as an introduction to the concept. Just remember; it has a mildly short shelf life, so don’t buy a bunch at a time! Buy one, see how it works for you, and add to your collection after that. Afterwards, you can snag yourself some Dark Angels, and fall back in love with your skin! If you’re looking for Fresh Face Masks, check out LUSH’s store locator to find a shop near you. You can order Dark Angels here.